I have always been inspired by gritty NYC street photography, and I had hoped to emulate the works of women such as Vivan Maier or Diane Arbus. But I was always too shy a street photographer, and was never happy with the results of my work. I’ve also always been aware that street photography crosses boundaries of consent and permission, and this weighs on me when I shoot photos. As someone who encounters street harassment in New York, and who teaches about consent and boundaries in my day job, I am especially careful not to publish photos of women on the beach that would cause them to feel discomfort, or photos that have crossed lines of consent I would not be okay with for myself. That being said, my series is about moments of love, tenderness, and vulnerability. The world can feel incredibly dark, many people are cynical about finding love in New York, and my aim is to soften these feelings with images of love and beauty. I love capturing intimate moments that take place in the hot sun and salty air. With Beach Lovers, I am able to bring a street photography approach to the beach. I am able to slip around with my camera undetected, as people are so wrapped up in each other, they fail to notice me. There is this extra level of intimacy that people engage in on the beach that I have not seen anywhere else. The towel becomes a little private island. It may seem a little voyeuristic of me at times, but people get hot and heavy sometimes, or fall asleep in awkward poses. They adopt this mini-vacation attitude, even on New York beaches, leaving the stress of the city behind. I like to see the limits and boundaries couples push that they would not do in any other environment. This series also came about because I am a huge beach lover and a surfer at Rockaway. When Hurricane Sandy hit, I started volunteering with the clean up efforts, and I brought my camera and documented what was happening. It a was a natural evolution to bring my photography to the beach permanently. There has always been strong Rockaway Beach community out there, but not many people associate New York City with beach culture, or give much thought to this tiny islip so far away from the streets of Manhattan. 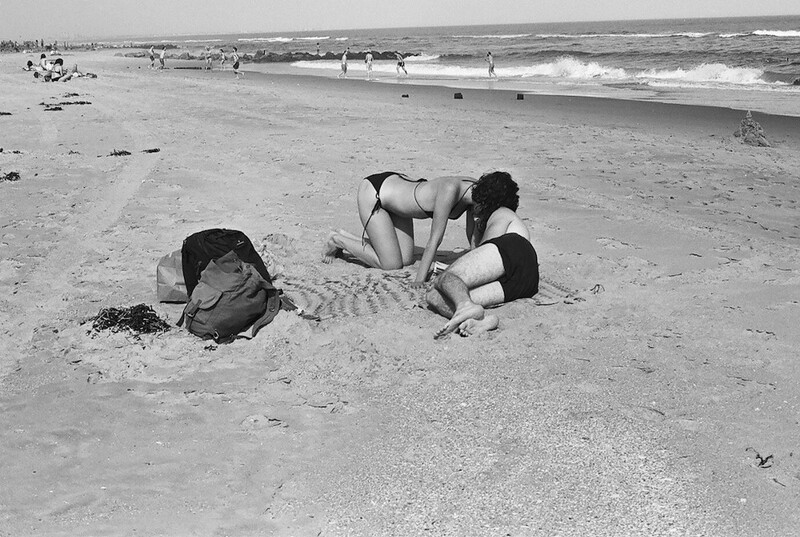 We tend to think of Coney Island as the go-to beach in New York for iconic photography. So the Rockaways, for me, has been inspiring to shoot because the area feels somewhat uncharted and lesser known, at least until more recently. I have so much more work ahead of me, and I am so excited by that. I love this project, and I aim to take it throughout the many beaches of the US and then globally. I’d like to explore how love and intimacy looks the same, or different, across the country and world. 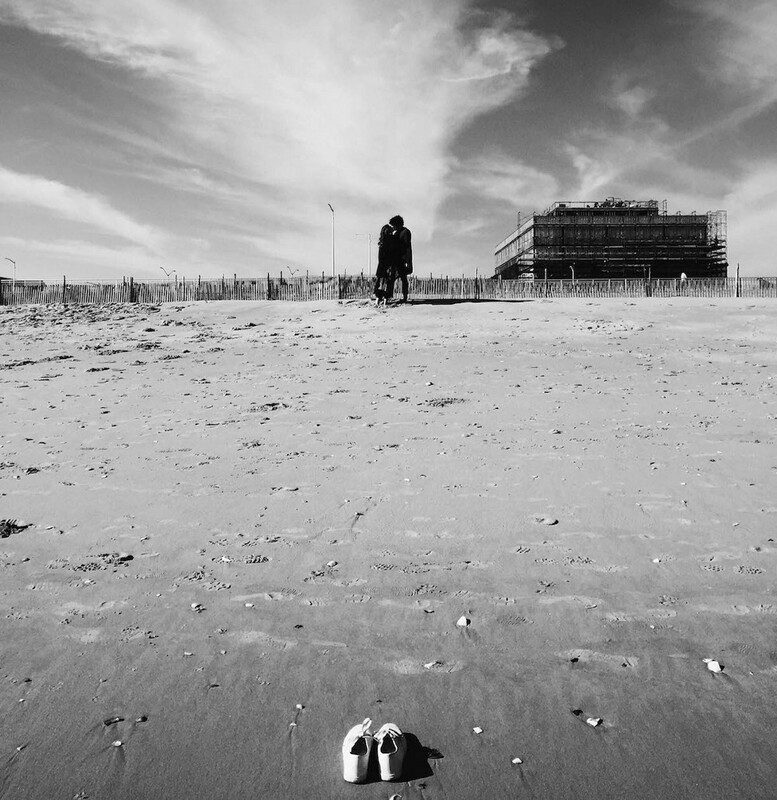 I plan to make a book and have a big exhibit next year, celebrating three years of Beach Lovers at Rockaway. Born and raised in Montreal, Canada, Erica Reade is now a Brooklyn based photographer. She is self-taught, and uses both digital and analog formats. Erica is an Artist Member of SohoPhoto Gallery in NYC, and was a 2015 National Natural Eye Scholarship winner at the Santa Fe Photography Workshops. She is founder of Camera of the Month Club, a unique gathering of young, dedicated photographers from across NYC who are as passionate about experimenting with different cameras as they are about shooting compelling photos. Follow more of her street photography on Instagram.